To make sure your jewelry is always ready to shine, these tips can help you to prevent your jewelry from tarnishing and becoming dull. What is tarnish? Why does it happen? Tarnish is a thin layer of corrosion that develops on metals like (sterling) silver and copper as their outermost layer undergoes a chemical reaction. Oxygen, airborne pollutants, dust and moisture are the main causes for tarnished jewelry. When jewelry gets tarnished / oxidized the metal often looks dull, gray or it looks like it has a black film / coating / patina, which can really reduce the beauty of your jewelry. When you are NOT wearing your silver jewelry, it is best to keep it in a closed box, away from (sun)light and air (oxygen). Jewelry boxes (like the ones your grandma used to have for example) are the best, so you can store all your jewelry in one place, but separate them inside the box. This way they are carefully protected and you’re making sure your jewelry will remain beautiful! If you have problems with chain necklaces that get tangled up, this might be a super tip! Especially when you’re traveling, but also to store your chain necklaces in your jewelry box: Open the lock of your chain necklace an put one side of the chain in a straw and the other side out, then close the lock again. If you put a piece of chalk or a bag of silica inside your jewelry box, it will absorb moisture. Change it for a new one every couple of months. you’re cleaning, since cleaning products can damage your jewelry or you might get it entangled somewhere, so you can put on cleaning gloves to protect your rings, or take off any jewelry you wear and store it safely. you’re sun ‘tanning’ or go out in direct heat or hard sunlight, because this might tarnish your jewelry or fade gemstones. You can clean your jewelry gently with some water and a soft cloth in order to remove skin oils, dust, makeup,… after each wear, it will really help prevent the forming of tarnish on your jewelry. Just make sure that the jewelry is really dry before storing it in your jewelry box. To be honest, I don’t do this every time for jewelry I wear almost every day. But for jewelry I wear only on special occasions and store it for longer, this is a real time saver (better to prevent than clean)! 7. Jewelry = finishing touch! Something else that has impact on the polishing and can make your silver tarnish faster: all kinds of soap, lotion, sunscreen, perfume, make up, hairspray,... since they contain chemicals that can be harmful to your jewelry. So when you are getting dressed it is best to first put on everything make up , body lotion or whatever, perfume, clothes,... and than jewelry as your last finishing touch! How to Remove Tarnish from Your Jewelry? In an earlier post, I’ve shared with you some easy tips to clean tarnished jewelry, using some a few ingredients that you probably have at home you will make your jewelry shine again! 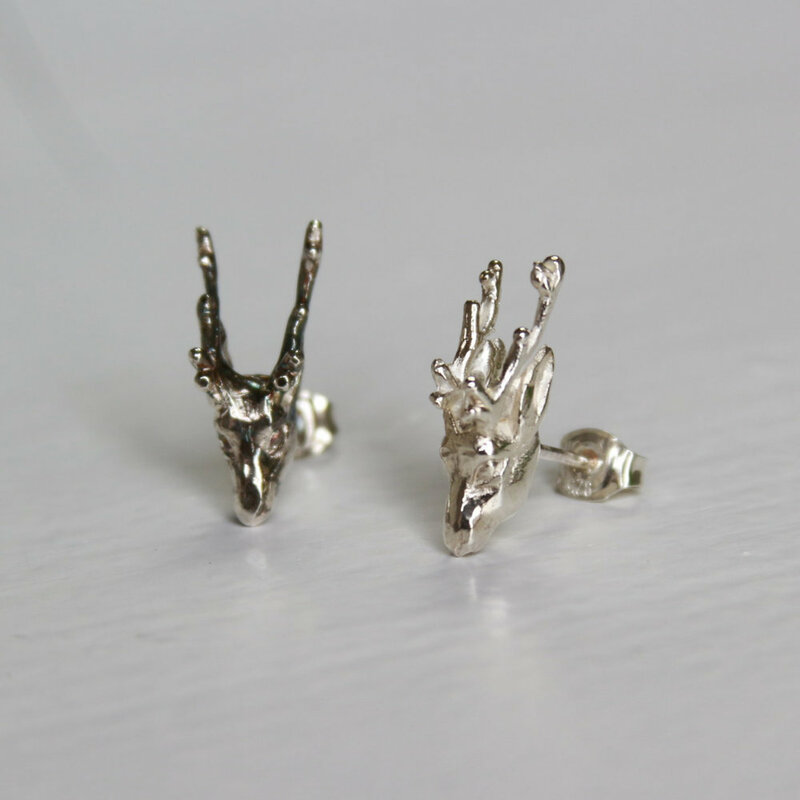 This blogpost is all about how I use tiny details from nature to create Sterling Silver and (18ct) gold jewelry. When I go outside for a walk in the park or we’re hiking in the forest : I am always inspired by nature and I am keeping my eyes open, looking out for beautiful, natural details. Like little leafs from a tree or a plant or seeds from a flower. Anything can really inspire me! I might take pictures to use as a reference later or I pick small details from nature and bring them home to my studio, that’s were the real fun begins! I’ll start playing around with these natural pieces, combing them, trying out different shapes and compositions. Sometimes I see a ring or a pendant or an earring in a new combination and I’ll work further in that direction. So I usually don’t sketch my ideas for these type of designs on paper, since they grow kinda organically while working at my bench. Some other compositions I might really like, but I don’t know how or where to wear them as jewelry. When I have pieces like that, it might help me to sketch a little to figure out what kind of jewelry it can become. Most of the time these pieces will be put aside and I’ll check them again later, because sometimes it just seems very difficult to know what direction to go with a piece, but after a break it is much easier. So how do I make those natural items stick together? Well, I use the lost wax technique, it is one of the oldest techniques in the jewelry making history. I use melted wax like a sort of glue to stick the pieces together. 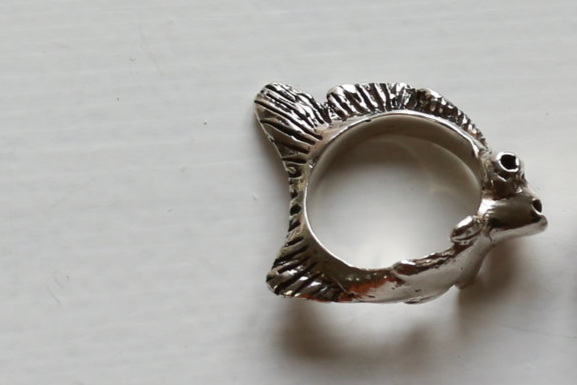 When I am happy with the designs, they’re casted into solid Sterling silver. The casting process is the only part of the process I am not doing myself, because I don’t have all the machines and materials you need for that. Luckily there are some casting companies nearby. STEP 1: I’ll start by cutting off the sprue with my piercing saw. STEP 2: I’ll file the area where the sprue was to make it smoother. STEP 3: With something like ear studs, for example, this is the moment I solder the Earring posts or do any other soldering that I need to do on that specific design. When it is cleaned after soldering it is time for STEP 4: to sand down the whole piece, but I’m always very carefull with this step, because I don’t want to take away the natural texture of these pieces. STEP 5: they are polished and cleaned up, ready for packaging and ready to wear. If you’re interested in finding out more, since this is just one of the many processes and techniques I use to create my jewelry, consider subscribing to my newsletter or follow me on Instagram or Facebook. Do you want to know what inspires me to create my jewelry collections? Read all about it in this blogpost! Sign up to the “letters from kornelia” with your email address to receive news and updates. Don’t worry, I hate spam as well, so I’ll only send you an e-mail when I have something interesting to tell you.